I couldnt be happier with these chairs. First of all the price is simply amazing! there are no other chairs in the marketplace that come close to matching the style, quality and price point of the Wishbone Style Chair. Believe me, Ive looked everywhere! They are also comfortable enough for their intended use as a dining chair or extra seating. They are designed to K/D for shipping and require easy assembly. I purchased the black. They have a sculptural quality that energizes a space. I was doing a long distance condo renovation and needed to change the delivery date once or twice and InMod was very accommodating with shipping. I received the chairs exactly as scheduled. This was my first purchase from InMod and I am now a firm fan. I thought these chairs were very excellent quality and stylish for the cost, love the backrest design, very happy with them! These chairs are silly. They look nice but they wobble like $15 dollar chairs. Not even worth the $75 bucks. Very disappointed. Purchased a set of 4 chairs total which are now part of my dining room table. They are very 'light' in their appearance and comfy as well. Eventually, I will use them during the summer outside as well. The look is great, the quality as well. Highly recommend them! ProsGood design & they look 'light'. got my feet wet and I love it! BEAUTIFUL!!! Excited they are finally HERE! Dining room is complete and looks better than i could have ever even imagined! THANK YOU! Unbelievably perfect! Color, style, price - entire order went smoothly and they shipped quickly! even more attractive in person! It wasn't until they arrived in person that I noticed all of the subtle curves and contours in the design! These chairs are gorgeous, like truly, I just thought the backrest design was cool until getting to see them up close and personal, real beauties! I'm impressed with the shape of the back and armrests, the curves bring a bit of elegance while the rest of the design is more structured and orderly, its like having the best of both worlds, these chairs completely recreated my dining room and i love it! Backrest is incredibly comfortable and supportive. I love the way it cradles my body. The design is charming and elegant. This product is very reasonably priced and great quality. completed my dining room with this addition! The Wishbone Style Dining Chairs are not stackable. The gray looks brown. Is it a true gray? The Grey color does have a hint of taupe to it, which will have a very subtle brown undertone. The weight limit for the Wishbone Style Dining Chair is 250 lbs. are these returnable if they don't work out? 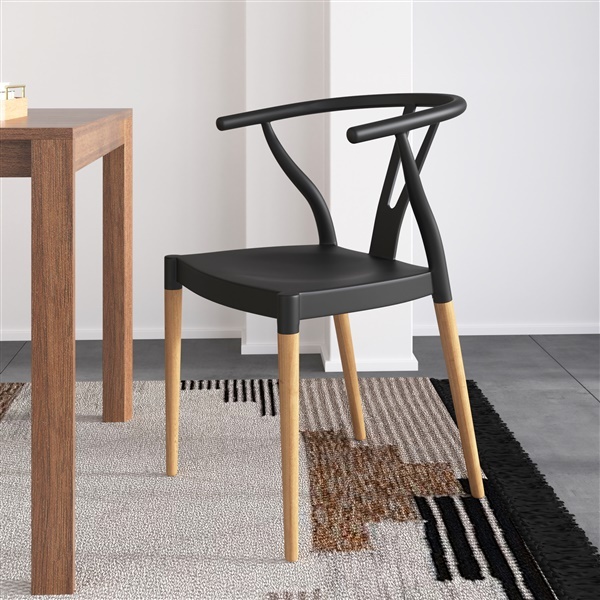 The Wishbone Style Dining Chair is an item that can be returned. Please see our Store Policies page for details in regards to Returns.